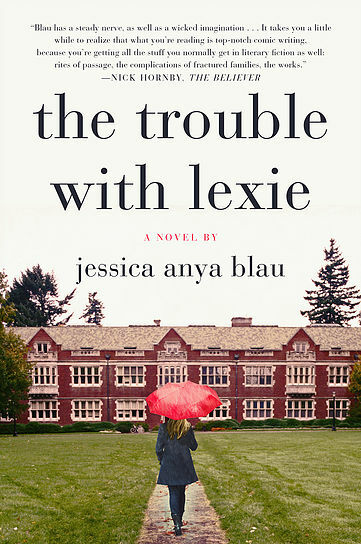 Jessica Anya Blau is the author most recently of the novel The Trouble with Lexie. 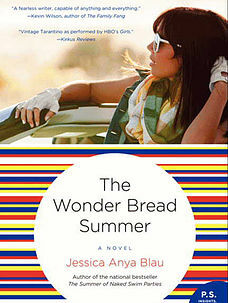 Her other books include The Summer of Naked Swim Parties and The Wonder Bread Summer. 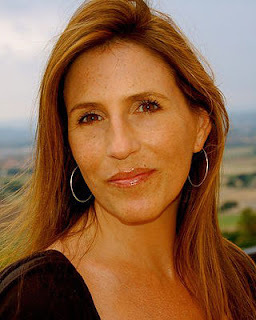 She taught writing at Johns Hopkins University and Goucher College, and she lives in Baltimore and New York. 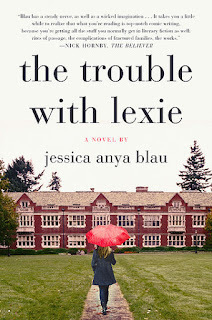 Q: How did you come up with the idea for The Trouble with Lexie, and for your main character? A: The story started after I met a man who had just come out of prison. I asked him what he’d gone in for and he said he had been addicted, broke into someone’s house, and stole drugs from their medicine cabinet. Those two sentences stuck with me and I used versions of them in the opening scene of The Trouble with Lexie. From that moment on, I was asking myself, who is this person who was so desperate she took these drugs and crashed on this bed? Essentially, I worked backwards. I found the place where she was (passed out on the bed) and wrote the whole book as a way of getting her to that bed. The more I wrote, the more she became a version of me. Neurotic, afraid and really, truly wanting to be good and do good, but finding that her unquestioning trust in most people can lead her away from herself; away from her intentions. 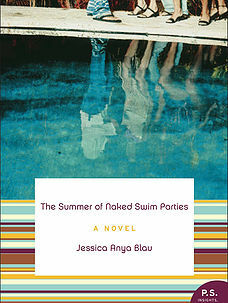 Q: The novel is set at a boarding school. Why did you choose that as your setting, and do you have any longtime favorite novels that take place at boarding schools? A: Julian Barnes wrote a nice boarding school book. And I recently read an advance copy of one called The Finishing School that was a great, quick read. I went to public school in Southern California so am not from that world. But when I had kids in Baltimore, I entered the bizarre and compelling world of private schools. I’m fascinated by the way in which these schools become a sort of shorthand for identifying oneself and others. Oh, you’re a BLANK ACADEMY girl and he’s a BLANK COUNTRY DAY boy and they’re a BLANK BLANK BLANK family. Also, my ex-husband went to Exeter so I’ve been enjoying his boarding school stories for years--particularly the stories of the sometimes-messy underside of things. Q: You start the book, as you mentioned, with a memorable scene. Was that the first scene you wrote for this book, and did you know at the time how the book would end? A: That was the first scene I wrote! After I wrote it, I set it aside and wrote from the “beginning” as I worked up to that scene. An early reader of an early draft pointed out that I should start with that scene and then go back in time and work up to it. It was good advice as it changed the pacing and tension of the story—all for the better. I didn’t know how the book would end when I started writing. The ending that’s there now is probably the 15th ending I wrote and it’s entirely different than the ending the book had when it was sold. Written and later-deleted endings included a move to the state of Alabama, mobile homes, multiple babies, death and waitressing jobs. Q: How have readers reacted to Lexie? A: A lot of people love her, and that makes me happy since she is a version of me (I’ve never made the HUGE mistakes she makes, but i can certainly see myself falling for what she falls for and ending up where she ended up). And some people say they can’t believe how awful she is for doing what she does. I certainly have no interest in defending her to anyone, but I do believe that every single one of us is capable of falling as far as Lexie falls. No matter how good we try to be, we are all vulnerable in some way or ways. Lexie happened to stumble into a situation that exploited all her vulnerabilities to the point where…well, I don’t want to give anything away. A: I’m working on a new novel. I have the title and the first 50 or so pages. I’m also co-authoring a YA book; we’re revising that now. I’m working on a kids’ book, too. I have a full draft of that. And I'm ghostwriting a memoir for a total badass, kickass, amazing and brilliant CIA agent. A woman. A: Hmmm, just that I appreciate and am thankful for anyone who picks up the book and reads it! --Interview with Deborah Kalb. Jessica Anya Blau will be participating in the Bethesda Literary Festival, which runs from April 21-23, 2017.